It’s so easy to become distracted by the many things that grab our attention throughout the day, that we lose sight of Jesus. This is very unfortunate because He never loses sight of us. He woke us up this morning and He didn’t have to, He covered the road with His blood and put a hedge of protection around us so that we could get to and from our destinations without any danger coming to us. He makes sure we have the basics –food, shelter, and clothing– so we’re comfortable in our daily lives. After doing these things and so much more day in and day out, all He asks us to do is, believe in His sacrifice, praise His name, love Him and one another, and tell someone of His doodness. What we have to do in return for His grace and mercy is so simple, we should be ashamed of ourselves when we don’t do them often enough, or at all. Over the past twenty years, people have made some wonderful technological advances. We have computers small enough to fit in our back pockets. We are forever connected to one another through social media. We can see what’s going on on the other side of the world in real time. We can get our news faster than ever before. While technology is wonderful, it is robbing us of our time with Jesus. We’re not praying like we should because our favorite tv shows take up our praying time. We’re not reading our bibles like we should, despite the fact that we have a bible app on our smartphones because every time we go to read the Word a social media notification pops up and takes priority over reading Scripture. We don’t love one another like we should because we don’t see others as our own self, so we don’t love them as such. Technology cannot take all the blame for us lacking in our duties to the Lord. We have to take some of the blame. If we were stronger in spirit nothing could separate us from God. Nothing. Not family nor friends, not Facebook, not celebrity gossip, nothing! Spiritual distractions begin when our hearts grow hard. We no longer feel Jesus’ presence, we no longer feel the pain of others. Once our hearts are hardened, we no longer hear the voice of the Lord because God speaks to and through the heart. Once our ears are closed to the voice of the Lord, we stop seeking Him. We lean on our own understanding. We put our faith in man. In the Scripture, Jesus warns that focusing on the things of the world–the material things, our own desires, causes us to remove Him from our lives. This is detrimental to our spiritual health. 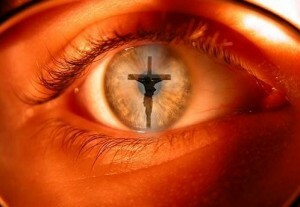 It’s very important that we keep Jesus the focus in our lives. When we do this everything else falls into place. Turn off the phone, get off social media, stop worrying about who did what to whom and who wore what and make time to read the Word and meditate on the goodness of the Lord. How will you focus on Jesus today?